J.K. Rowling announced today on Pottermore that the official scripts from the upcoming two-part stage play, Harry Potter and the Cursed Child Parts I and II, will be available in print and digital versions as a "Special Rehearsal Edition" later this summer, shortly after the stage production's debut. As soon as die-hard Harry Potter fans watched the golden trio wave off their children at platform nine and three-quarters, 19 years after the Battle of Hogwarts, they quickly craved for more from J.K. Rowling, the author that penned all seven books in the magical series turned major film franchise. The announcement of a stage production excited every muggle around the world, though plane tickets, a hotel, and a ticket to the performance would cost you a hefty penny (better stop at Gringotts). Fortunately for the rest of us, Rowling will be releasing the script simultaneously with the play's London premiere in July. "Pottermore is proud to be a key part of the multi-platform effort that will allow the epic eighth Harry Potter story to be read and enjoyed by a wider, global audience," Susan L. Jurevics, Chief Executive Officer of Pottermore, said in a press release. "With the script eBook of Harry Potter and the Cursed Child helping to lead the way, 2016 will be one of our most exciting years yet. We have other innovative content initiatives coming soon that will also thrill and engage our vast global audience of Wizarding World fans as well as create new ones." Harry Potter and the Cursed Child picks up right where we left off, and will be staged in two parts due to the "epic nature of the story." Life has never been easy for the boy that lived; we learned in the epilogue to Deathly Hallows that he is now a Auror for the Ministry of Magic and father of three: James, Albus, and Lily. His youngest son, Albus (who was sorted into Gryffindor, the house of both his parents, Harry Potter and Ginny Weasley), faces the weight of his family's legacy, learning that darkness comes from unexpected places. 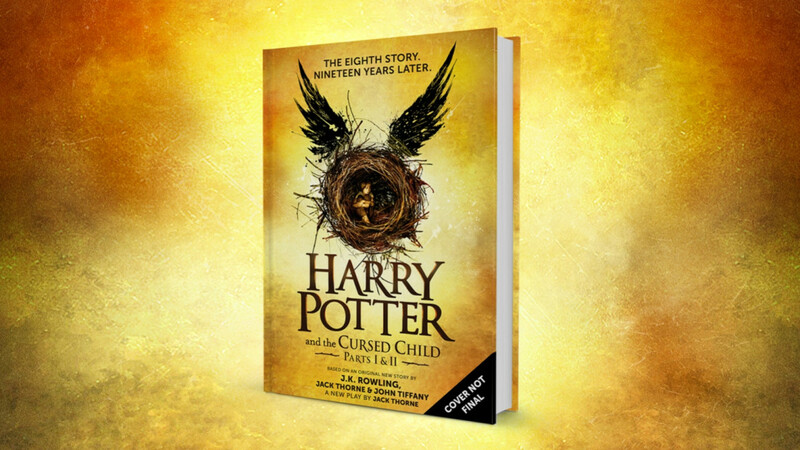 The Special Rehearsal Edition of the Harry Potter and the Cursed Child is a comprised version of the play's script and will only be available for a limited time as the script is subject to change prior to the opening performances. A definitive collector's edition will be available at a later date. Harry Potter and the Cursed Child, an original play by Jack Thorne based on an original new story by J.K. Rowling, will debut at the Palace Theatre in London on July 30 and is the first official Harry Potter story presented in a theatrical production. In collaboration with Little, Brown Book Group in the United Kingdom and Scholastic in the United States and Canada, the print editions will be published on 12:01 am on July 31 (Harry Potter's birthday), priced at $14.99. The wizarding world has greatly expanded recently, with new content on Pottermore released earlier this year that included information on four of the eleven prestigious wizarding schools around the world: Mahoutokoro in Japan, Uagadou in Africa, Castelobruxo in the Brazilian rainforest, and Ilvermorny in the United States (information still yet to be released). Pottermore also brought back the Sorting Hat and Ollivander's wand shop. J.K. Rowling will also be making her screenwriting debut with her film, Fantastic Beasts and Where to Find Them, taking us deeper into the wizarding world on November 18. Are you excited to expand your Harry Potter book collection? We did our waiting—NINE years of it—in Azkaban! Will you be one of the chosen ones to see the stage performance in London?